We could all use a little less gross and lot less waste. The Fresh Air compost collector lets oxygen move through your organic kitchen waste, slowing down decomposition. The result? A stink-free solution even the neat freak in you can get behind. Less mess, less odor and flies. Made from durable plastic and steel, the Compost Collector features top and bottom venting that allows air to circulate through compost, encouraging aerobic breakdown and limiting moisture for less mess and odor. Dimension: 11.25 wide x 8.5 wide x 9 tall. What's so great about composting? For starters, there really is nothing better for soil than compost. It not only loosens clay soils, but it helps sandy soils retain water. And best of all, it contains no petroleum-based compounds, as many commercial fertilizers do. Gardens that use compost produce higher yields of healthy fruits, vegetables and flowers. Plus, landfills are running out of space. According to a recent EPA estimate, almost a quarter of the garbage in this country is composed of food scraps and yard trimmings -- that's about 60 million tons every year. So if you're not composting yet, it's time to start. If you live in a city apartment or in a home without a yard, it's likely that yours area has a community composting center. Check out Earth911.com or the EPA for local resources in your area. I received a brand new compost collector after the lid on mine broke. I am very happy and back to using it every day! (Keeps me from having to run outside to the big composter all day long) Totally recommend! No smell, no bugs! I love this. Have to keep on top of emptying in a timely manner, but works great! This container is the perfect size to have on my kitchen counter. No bad smells. Love it. To assure your compost collector doesn't collect bugs and smells, especially if you live in a warm humid climate, it is best to empty it into your compost pile, at the end of each day, before dark. Also, do not put anything containing meat or dairy (creamy salad dressing) in the composter. It works if you use common sense! I had this and used this for a little less than a year. One day I heard a noise looked over and the top was flying off. One of the hinges had broken. 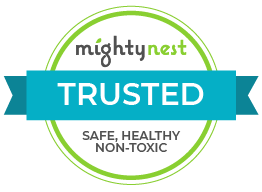 I emailed MightyNest, told them what happened and asked if anything could be done to replace the lid. She said she would contact the manufacturer and get back to me. Never heard from anyone again. That was 6 months ago. Too bad because I really liked the product. Hi Jen, I'm so sorry about the communication breakdown! I do see that we received your original email and requested a replacement from the manufacturer so I'm sorry that didn't make it to you! Someone from our customer service team will reach out to you directly to make sure you get the replacement! Thanks for your patience. I was so looking forward to trying this item because it said less smell and less bugs and I was hoping to find something that I didn't have to empty every day . Not only did it smell, after day 2, I was met with a cloud of gnats when I opened it. It’s a simple reality: our product choices are limited to what we can find on store shelves. And more often than not, products that are the most accessible aren’t always the most eco-friendly. Or good looking. That’s just the way it’s been for ages. But the game has changed—with Full Circle’s line of stylish, functional products made from sustainable and renewable resources. Like scrub brushes with sleek, bamboo handles and sponges made from cellulose, a plant-based fiber. They’ve even made pot scrubbers that fully biodegrade! Important behind-the-scenes changes are happening at Full Circle, too—such as improved working conditions, cleaner manufacturing methods and higher environmental standards. Even their suppliers have come around to their way of thinking. (They’re kind of persuasive that way. )At Full Circle, we believe in constantly striving to do things better. Because while there may be a finite number of resources in the world, there’s an infinite number of ways to use them more wisely. And figuring out how to do that is what gets us up every morning.